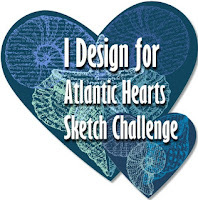 Check out the sketch for this week at Atlantic Hearts Sketch Challenge. I pondered over this one for a while. 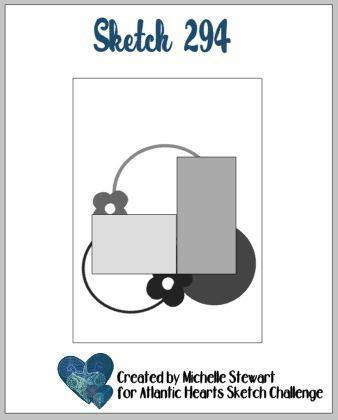 I am usually so literal when it comes to sketches so I decided to play a little outside the box!! Instead of 3 individual circles, I went with one big one...in the shape of a wreath...the Seasonal Wreath Dynamic Textured Impressions Embossing Folder from Stampin' Up to be exact. I sponged a little ink over the embossing to really make it pop!! Then I pulled out my Candy Cane Seasons bundle and some non-traditional colors of ink to finish up the card. I was able to make rhinestones whatever color I wanted by coloring them in with a Stampin' Blend. A fun card influenced by an even funner sketch from Atlantic Hearts Sketch Challenge. Sure hope you can join us this week.